I have loved funnel cakes since I was a little girl. Every opportunity I get, which isn’t often thankfully, I indulge in a funnel cake. It is the quintessential fair food. I came across this recipe in a booklet I purchased at my library’s bookstore. It’s Taste of Home Contest-Winning Desserts, published in 2008. Week 15 recipe in the 52 Week New Recipe Challenge is for funnel cakes. Are these ever fun to make! A bit messy but fun, none the less. The key is to make sure when you are swirling the batter to make sure all parts touch so you have a round, full funnel cake. The batter will keep in the refrigerator for a couple of days but make sure you bring it to room temperature before making any funnel cakes. In a large mixing bowl beat eggs. Add milk, water, and vanilla until well blended. In a separate bowl combine flour, sugar, baking powder and salt; beat into egg mixture until smooth. In a skillet filled with an inch of oil or a deep fat fryer, heat oil to 375 degrees F. Cover the bottom of a funnel spout with your finger and ladle 1/2 cup of batter into the funnel. Holding the funnel several inches above the skillet, release your finger and move the funnel in a spiral motion until all the batter is released (scraping with a rubber spatula, if necessary). Fry for approximately 2 minutes on each side or until golden brown. Drain on paper towels. Dust with confectioners sugar and serve warm. 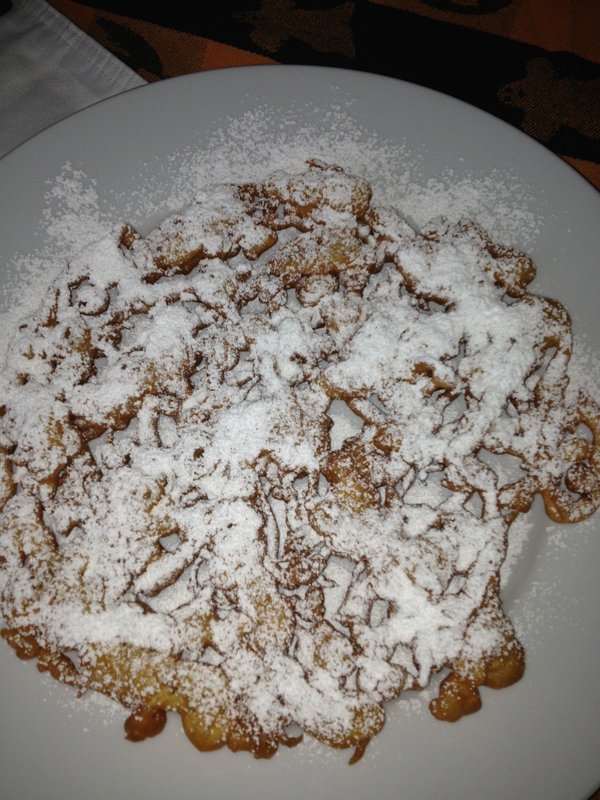 This entry was posted in 4th of July, 52 Week Challenge, Desserts, Holidays, Kid's Favorites and tagged fair food, funnel cake, Powdered sugar, taste of home. Bookmark the permalink.